A West Midlands theatre will be demolished as part of £10m regeneration plans, a council has said. 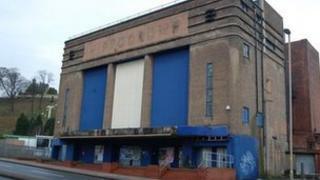 Campaigners had put forward a plan to save the Dudley Hippodrome by turning it into a community theatre. But Dudley council said the idea was "not financially viable" and it had now submitted a planning application to knock it down. The council said it was in talks with nearby Dudley Zoo to build an education centre on the Castle Hill site. Council leader David Sparks said: "An independent study has told us it [reopening the theatre] would require an investment of £5-10m. "Even then the building would require a significant subsidy, which, in the current climate, I think most people will appreciate is something we cannot commit to. "I can confirm that we are in early discussions with Dudley zoological gardens about a potential project on the former Hippodrome site," he added. Geoff Fitzpatrick, 70, from the Friends of Dudley Hippodrome campaign group said he was "disappointed, but not surprised". "This has been on the cards for a long time, but the campaign goes on," he said. "The council is saying it will cost £5m to save the theatre but no-one has done a true cost analysis. It will cost just as much to knock it down and build a new centre." He said the group would be meeting with councillors next week. The Dudley Hippodrome was built 1938 and was used as a theatre until 1964, when it became a bingo hall. The building has been empty since 2009.